SIR: Having made only a brief report as commanding officer Troop H, Ninth Cavalry, principally of casualties, after the battle of San Juan, July 1, 2, and 3, 1898, and understanding since that the reports, if any made, by troop commanders were not appended to regimental and brigade reports, I have the honor to submit a full report of the part taken by Troop H, Ninth Cavalry, in that engagement. The troop arrived at El Poso about 12.30 a. m., July 1, with the squadron and lay down and slept till daylight. After a hasty breakfast we were soon prepared to march and waited some time for orders, the men sitting down in column of fours. About 7 a. in. the squadron was ordered forward, and H Troop being in the lead that day I was directed to follow the Cubans. The Cubans had filed by us about one-half hour before we started and had gone down the trail that led into the bottom toward the crossing of the rivers and the heights of San Juan. Having marched about 300 or 400 yards down this trail we were halted on account of these men, who were standing still and who blocked up the road. In a few minutes the brigade commander (Colonel Carroll) rode up, and we were ordered to precede the Cubans. They gave way for us, falling back in the brush and sides of the road, making an opening through the center of their column, through which we passed. When our column passed through I was ordered by Colonel Carroll and also by our regimental commander, Lieutenant-Colonel Hamilton, to move forward my troop as advance guard till I reached the river, and there to halt and take up a position. I accordingly ordered Second Lieutenant Hartwick to move forward the first platoon as vanguard, with "point" advanced about 200 yards, and to push out flankers wherever openings in the dense brush would permit. I followed with the rest of the troop at a distance of about 300 yards, keeping up connecting files to the front and rear. I also sent out flankers from my reserve whenever a side path was crossed. When we started to march our batteries on the hill in our rear opened fire on the enemy at San Juan, and the guns of the enemy replied to this fire, the projectiles from both passing over us as we advanced along the road. We had advanced about I mile when Lieutenant Hartwick sent word back to me that he had reached the river (Acquadores Ford) and could see the enemy and their works distant about700 yards. At the same time Colonel Carroll and Captain House rode up and directed me to cross the river and reconnoiter a short distance beyond. The troop took up the march again. Lieutenant Hartwick crossed the ford and moved with the "point" cautiously up the main road and the trails leading therefrom for about 200 yards, when he received five or six shots from the enemy's small arms, the first that had been fired in this action. He then halted and deployed the men in groups along his front. I crossed over with the reserve, deployed it to the right, and moved forward in the brush and high grass till I had reached a point on a line with the advance party; ordered the men to lie down and not to fire without orders. Our line then covered the ford and stream a distance of about 300 yards. Leaving the first sergeant with my part of the line, I moved over to the left and sent a patrol from the advance party along a trail that led down the stream. 1 then went back to the ford to see if the other troops were coming up and to receive further orders. I saw General Hawkins at this time with some of his aides examining the position of the enemy from the top of a tree near the ford. The squadron not appearing, I returned to my troop and waited about half an hour. Lieutenant Wood, our adjutant, then came up from the right and told me the squadron had crossed the stream higher up to my right, and directed me to move by the right flank and join it. The day was now extremely hot and a heavy fire from the enemy had commenced. Lieutenant Wood was wounded, and, thinking the battle about to begin for us, I ordered the men as they moved to the right in single file to pile up their rolls and haversacks and retain only arms and canteens. This was done, and I placed Saddler Lochman in charge of the property, telling him to seek cover close by. Subsequently, before daylight July 2, I had the rations brought up and later the blanket rolls, with little loss of either. had been called to the right. I ordered Lieutenant Hartwick to follow in rear, deployed the troop into line, and, placing myself in front of the center troop, passed over the hill, down the slope, forded the upper end of the lake, and moved quickly up the slope to the Spanish works, but the enemy had given way. Colonel Wood, First Volunteer Cavalry, who had succeeded to the command of our brigade, came up and ordered me to move over to the right with my troop and hold certain hills which he pointed out, at all hazards, till I was relieved. I accordingly moved over and occupied the ground indicated. I sent Lieutenant Hartwick to patrol still farther to the right, where he found C and D troops of our squadron in position. Later the squadron was assembled on the ground occupied by me, and remained there till relieved about 7 p.m. by the Thirteenth Infantry. 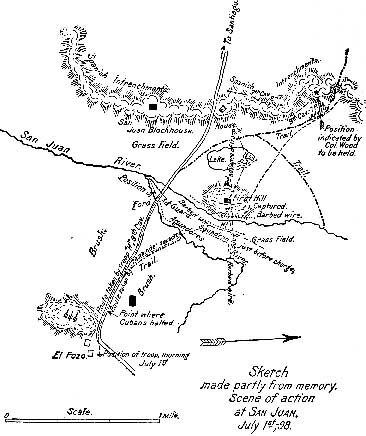 The next morning, July 2, the troop moved with the squadron to the left and rejoined the cavalry division near the center of the line. Here the troop continued digging and occupying intrenchments until the surrender of the Spanish army and city of Santiago. It will be seen from the foregoing account that my troop was the first organization to penetrate and reconnoiter the ground to the front the morning of July 1, and crossed the first river, the Acguadores, near its junction with the San Juan, several hundred yards in advance of other troops. The country is covered with a dense undergrowth, and great caution had to be exercised to avoid being ambushed by the enemy. In this connection much credit is due Second Lieut. Edward E. Hartwick,, Ninth Cavalry, who conducted the movements of the "point" and flankers in the advance. Lieutenant Hartwick pushed steadily on until he was fired on by the enemy and directed by me to halt. This officer displayed great coolness in a very trying and dangerous position. During the assault and throughout the entire day, by his courage and prompt action., I was enabled to get the best results from the troop. I recommend him for consideration. As to the enlisted men of the troop, they all did well and displayed patience, courage, and discipline of a high order. I wish to particularly mention Sergt. Elisha Jackson, now second lieutenant, Tenth United States Volunteers, who, during the movement in the morning, July 1, was in the extreme advance (the point), and during the whole day was ever in the front and by his example encouraged all about him. Also Privates Bates and Pumphrey, who, while the troop was under a heavy fire, stood up and moved out from cover the better to see and fire on one of the enemy who, from a tree in front, was firing on us. Also of Sergt. John Mason and Private Nelson, who were badly wounded while charging up the hill near the head of their troop; and of Private Edward Davis, who, although suffering from a scalp wound, the blood streaming down his face, only waited to have his head bandaged when the first hill was taken and then joined the troop in the next advance. I feel that the record of the troop would be incomplete were this report not made, and respectfully request that it be appended to the regimental report now on file in the Adjutant-General's Office. First Lieutenant, Ninth Cavalry, Commanding Troop H, while in Cuba.